The second wave of SplashlingsTM,, one of the year’s most sought after collectibles, arrives at Walmart in February 2017 – joining the bandwagon of the other major retailers carrying these beauties! TPF Toys latest addition of mermaid-themed characters and friends feature a series of ultra-rare color change characters, that when dipped in icy cold water, amazingly changes colors! Invented by the famed Pound Puppies®creator, Mike Bowling, Splashlings features An Ocean Full of FriendsTM. Over 100 new mermaids, ocean friends, gems, shells, and treasures join the Splashlings family, affording kids more than 200 ocean-themed characters to collect between the two waves. In this wave there is quiet a selection of toys for your mermaid fan. You can pick up a Mermaid 12-pack that includes a Mermaid, seven Splashlings (plus a hidden one) and 2 seashells. There is also a 6-pack assortment that has 1 Mermaid, 4 Splashlings and one seashell. 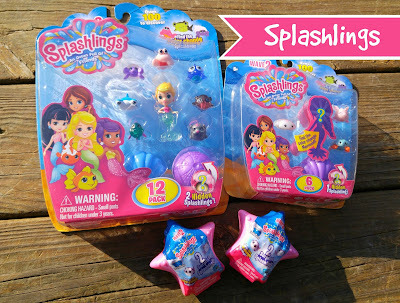 For those who like surprises can pick up a Splashlings Ocean Full of Friends 2-pack that features a surprise each time! A two pack of Splashlings Collector Shell is also available. With Valentine's Day around the corner, these Splashing toys and sets would make any little girl swoon! New also this month is the Coral Treasure Park where the gang can swim around the coral, slide down the aqua slide or go for a swing. Then relax by chilling out in the shell hot tub. The Splashlings Medical Center Playset is where Splashings and their friends can get cured by Sturgeon Surgeon and Nurse Shark! We were recently some Splashings and they were a huge hit. The Splashing 6 pack and 12 packs offer an ocean full of friends in one pack. They are the perfect starter sets. Did you know that there are over 100 to collect in this wave: mermaids, ocean friends, gems, shells, and treasures? Kids will have hours of fun playing with these adorable toys and collecting them! Add more Splashings to your collection with the mystery packs. Each one contains a fun new ocean friend. Keep the collection sheet that is included in with you Spalshings, so your little collector and track which characters they have and which ones they need! These are perfect for adding to your purse to keep the kids entertained while out and about. They are small and don't take up much space! TPF Toys is an Australian-based toy company that develops, manufactures and markets a diverse portfolio of innovative toys sold in more than 45 countries worldwide. Founded in 2007 and with offices in Melbourne, Sydney, New Zealand, Hong Kong, China, Vietnam, and Los Angeles, TPF Toys has over 200 employees worldwide and relationships with top tier retailers and entertainment companies including Toys ‘R’ Us, Disney, Nickelodeon and 20th Century Fox. TPF Toys brand portfolio includes SplashlingsTM, Peppy PupsTM, MagicCutTM, Stack-A-BubbleTM, Paddle BubbleTM and Mystery Eggs.